Glass Animals released their second album, How to be a Human Being, as a follow up to 2014’s ZABA. The album was released on the August 26th 2016, on Caroline Records, and features the singles ‘Life Itself’, ‘Youth’ and ‘Season 2 Episode 3’. The album opens up with the exuberant ‘Life Itself’, a song with drum beats reminiscent of those from the other side of the world, futuristic synths and unbelievably humorous and catchy lyrics- “She said I look fat, but I look fantastic”. It’s a huge summer anthem- one which I’ve had on repeat- and it presents itself with funny, yet tragic, characters, many of whom make up the album. ‘Youth’ is a sad song, sung from the perspective of a parent to a child. Dave Bayley (lead singer) said the song was “inspired by a devastating story [he] had heard from a stranger about her song” (to NPR). I love the ‘video game’ feel of ‘Season 2 Episode 3’, with its video game sound effect samples, which remind me of something from Super Mario Bros. There are references to cartoons in there too, like Adventure Time. Again, it’s a song filled with many a hilarious and interesting lyric, this time about a lazy female character- “My girl eats mayonnaise from a jar whilst she’s getting blazed”. ‘Pork Soda’, ‘Cane Shuga’ and ‘The Otherside of Paradise’ continue this fascinating story filled with characters. It’s very easy to listen to, whilst still being unique and interesting. ‘[Premade Sandwiches]’ is 36 seconds of distorted speech. When you look at the lyrics, it’s an ‘interlude’, if you will, of post-modern references, almost poetically put together. The lyrics speak the truth and heartache of modern life- I suppose it’s how, really, human beings are now. There’s references to a “superfood” obsessed country, McDonalds (“People standing in line to buy whatever the McFuck they might want to shove down their foodpipes tonight”), plenty of emphasis and repetition of “people standing in line” and the concept of having to have “new” things. I like it; it’s clever. The album closes with ‘Agnes’, a slower tempo song. The song is written about Agnes, another character we meet in the album. It’s a beautiful, yet tragically sad, song which outlines watching a friend succumb to drugs and not really being able to help or intervene. It’s an incredible song, which is allegedly Dave Bayley’s favourite on the album- I can definitely see why. It’s a poignant closer to the album, but it leaves a lasting impression on the listener. It’s important to talk about the album artwork here. The album cover features 11 figures, characters even, each relating to a song. The characters look somewhat similar in arrangement to a dysfunctional family photo and I like the idea that they are the cast of the album- all inspired by stories told and heard on the road. Overall, I love the album and the stories behind it. I think that it’s a brilliant album full of huge hits and bittersweet songs, tragic tales and upbeat, oriental anthems. The band are on tour of the UK in October this year and again early in 2017. This is the second of four blog posts about the festival weekend. You can find the first post and the ‘introduction’, if you like, here. Whilst this post is about the Friday of the festival, I saw a handful of brilliant acts on the Thursday evening and thought it’d be worth giving them a quick review too. Whilst the music technically doesn’t start until Friday, there’s always the odd act which plays on the Thursday evening. We managed to see three live bands (Clean Cut Kid, DMA’s and Rat Boy) on Thursday evening on the William’s Green stage- one of my favourite stages of the whole festival. William’s Green is an incredible little stage. It’s a stage which bursts with “new” talent, with the odd surprise. I suppose I have so much affection for it because last year I saw artists like Swim Deep and Palma Violets play sweaty little energetic shows there which had a totally different dynamic to their other performances, incidentally on the Other Stage, across the weekend. CLEAN CUT KID– Clean Cut Kid were a pleasant surprise to see hidden among the line-up. I had wanted to see them, having heard them being played at work and on the radio, for a while as I love how chilled out and cool they are. They played a short set compared to many of the acts across the weekend, but they managed to satisfy a music hungry crowd (and it’s very hard to follow the hype and enthusiasm of a The Smiths tribute act, called The Smyths). They’ve got that Of Monsters and Men and The Lumineers feel about them. They’re a band to keep an eye on and I recommend you have a listen to “Vitamin C” or “Runaway”. RAT BOY– I felt a bit sorry for Rat Boy. Unlike Clean Cut Kid, they weren’t previously listed on the line up for that slot. It was simply labelled “live band”. Whilst I was overjoyed about it being Rat Boy (knowing I would miss him playing on the John Peel Stage on the Friday), there were plenty of perplexed people there thinking it would be someone ‘huge’- the Radiohead rumours were rife throughout the weekend. Whilst not Thom Yorke, Rat Boy played an energetic and fun set. They played songs such as “Left For Dead”, “Sign On” and “Move” as the tent gradually thinned out. The crowd weren’t really feeling it and it looked as though the Essex lads were having a pretty painful time with a crowd that was almost dire. Rat Boy gigs are often hot and sweaty with plenty of “moshing” and dancing. This, on the other hand, was an hour or so of Cardy (Jordan Cardy or ‘Rat Boy’) shouting “JUMP” at a crowd with no intention of moving, other than out of the tent. The attempt at a “wall of death” style move was particularly hilarious to witness. Nonetheless, they played an incredible set, it just wasn’t really appreciated by the middle aged, ever hopeful Radiohead fans. This year the Friday of the festival was headlined by Muse. It was a day filled with an eclectic bunch of music, rain (including non-waterproof jackets), sun and plenty of mud. Acts across the day included James, Skepta, ZZ Top and Foals. Everything seemed to be going wrong for those working at The Other Stage on Friday morning. The main area surrounding the stage had been fenced off to allow the preservation of the last remaining green patches of mud and the recovery of the land prior to the mad rush of people, but when it’s 10 o’clock (and the first act is due on at 11) and you’ve still got wood chippings to put out, tractors to move and a, erm, wall to build, you’ve got a few problems. After a somewhat wild (yet, attempted to be controlled by specialised security) rampage, The Other Stage was opened by none other than Michael Eavis (the first of a few lucky sightings) cutting a red ribbon before 80s band James took to the stage. I grew up listening to James in my dad’s car, so I was weirdly looking forward to seeing them. Granted, I only knew one song prior to seeing them (that being “Sit Down”, which they, devastatingly, didn’t play), but they managed to impress a crowded field of fans. They dedicated “Sometimes” to none other than Michael Eavis, as, apparently, “when you look into his eyes you can see his soul” or something. They managed to embody the spirit of the festival as Tim Booth (lead singer) got into the crowd multiple times, managed to crowd surf and ended up with a beautiful mud smear across his forehead (and finished the show with it). Eavis branded them “one of the best bands of the 80s” and they certainly did deliver a brilliant set filled with new and old songs. Stockport’s finest, Blossoms, played on the Other Stage for the first time this year. Blossoms are an incredibly talented new, up and coming band. If you’ve not listened to them yet I strongly urge you to do so (as I do believe they’re about to become huge). They played songs such as “Getaway”, “At Most a Kiss” and “Blown Rose”. They dedicated “Charlemagne” to their late friends in Viola Beach- the first of many Viola Beach tributes across the weekend. Viola Beach were touring with Blossoms when they, and manager Craig Tarry, were tragically killed in a car accident. The band also played “My Favourite Room”, which is a new song. Blossoms are brilliant and can be found at pretty much every festival this summer as well as on tour this autumn, it’d be stupid not to see them whilst you can. Two Door Cinema Club are well and truly back. At this point on the Friday afternoon it was pouring with rain. The pouring rain over the Pyramid Stage juxtaposed the sun kissed indie rock of Two Door Cinema Club’s set and was almost even distracting. The band played songs from their two previous albums, “Beacon” and “Tourist History”, as well as their latest single “Are We Ready? (Wreck)” from their new album “Gameshow”, which is due for release this October. They also played the title song, “Gameshow”, from the album. The Irish lads managed to win the crowd over in the rain by playing the upbeat hits, such as “Undercover Martyn” and “Something Good Can Work”, before ending with the hugely popular “What You Know”- which even my dad knew. Everyone (surely) knows, or at least recognises, a Two Door Cinema Club song, which is what makes them so fascinating to watch. I think the band are back and better than ever and I look forward to seeing them (hopefully) lots over the next year, with their new album. Jess Glynne, accompanied by her live band and two dancers, played the Pyramid Stage at the festival and made the sun come out. She wore the most incredible green suit, too (on a completely unrelated note). Jess Glynne had to pull out last year, due to illness, so it was exciting to see her come back and play at the festival this year. She played an optimistic, fun set, perfect for a Friday afternoon. She played songs from her debut album, “I Cry When I Laugh”, such as “Hold My Hand”, “Don’t Be So Hard On Yourself” and “Take Me Home”, as well as emotional acoustic version of “My Love”, for her parents, and songs which she collaborated with the equally as brilliant Clean Bandit on (“Rather Be” and “Real Love”). Glynne was just one of the strong female artists I saw over the weekend and she shone a beacon of light for the women in music. It was incredibly refreshing and inspiring to see someone like Jess Glynne play high up at a prestigious festival like this. She was one of the best acts over the weekend, too! Just before Muse took to the stage Oxford’s Foals played. Allegedly, the festival wanted Foals for The Libertines’s surprise slot last year, so it was hardly surprising (especially after the success of their latest album, “What Went Down”) that they were asked to play this year. They played a nostalgic set filled with old and new songs. “My Number”, from “Holy Fire”, always gets the crowd going and warmed the crowd up for Muse. They also played songs, such as “Snake Oil”, “Mountain At My Gates”, “What Went Down” and, the lengthy, chilled, “A Knife In The Ocean”, from the newest album. These songs proved popular with the Worthy Farm crowd. The PR and sound broke during the last song, “Two Steps, Twice”, but it was amazing to see the band still going on unfazed and unaware nonetheless. They played a triumphant set and proved worthy of their huge set. They’re definitely headliners of the future. The band will co-headline Reading and Leeds later this year. Muse headlined the Friday night of Glastonbury Festival, on the Pyramid Stage. They played off of the back of their recent arena tour, with their latest album “Drones”. Whilst there were no drones on site, as it was not allowed by the farm, the set proved simply mind blowing to watch. I’ve never been hugely into Muse, but even I thought this set was something else. They opened, behind and through doors, with “Psycho”, after a tape had played. There was a huge graphic of a military figure plastered across all the screens saying things like “I am a psycho killer”, which is quite disturbing and unsettling. The band know how to put on a show though. Matt Bellamy’s (lead singer) singing and guitar playing were perfectly executed and added to the buzzing atmosphere over the night. They played songs, such as “Supermassive Black Hole” and “Madness”, to which the crowd sung along. The songs were cut up by various clips and tapes, such as a speech by JFK. It was all very cleverly put together- their production (and stage presence) is definitely worthy of such a big slot. Muse ended with a three song encore (before being cut due to curfew). They played “Uprising”, “Mercy” and “Knights of Cydonia” as the encore and left the crowd wanting more as they exited the stage at just got twelve! The band pulled off a tricky set with ease. Live settings, like this, definitely do them justice. Where do you even begin with Glastonbury? This year you’d probably have begun stuck outside for hours waiting to get in on Wednesday morning, or not as the organisers advised. Glastonbury 2016 was an experience. Hundreds of thousands of dedicated music fans flocked, through the rain, wind and mud, to Worthy Farm on a musical pilgrimage to see some of the greatest music the world has to offer- as they continue to do year on year without hesitation. This year’s event ran from the 23rd to the 26th June 2016, although many arrived early (on the 22nd or 21st). It was headlined by Muse, Adele and Coldplay- a crowd pleasing, high profile selection (which was not to be scorned upon). You can’t describe what makes Glastonbury special. There’s some sort of addictive magnetic pull which drags you in. Whether you’ve a fascination in music, art or… well… food and drink, there’s something for everyone. The age range is staggered to say the least. There’s babies (of literally 6 months) and so-called “grannies” of 86 onwards- and everything else in between! You can escape the “real world” for a bit and be whatever you so desire and there’s something extremely empowering and liberating in that. There’s a Glasto for everyone and I urge everyone to try it at least once in their life. No, the toilets weren’t that bad, the camping is actually quite fun (many don’t sleep and those who do are too shattered to care about the less that admirable sleeping conditions) and no one really cares what you look- or smell for that matter- like. As for the rain, I’d advise an actually waterproof coat (sometimes practicality has to prevail and the yellow mac won’t suffice). You can’t stop the weather and it doesn’t seem to stop anyone. This year the women seemed to rule Glastonbury. We always complain about the lack of female artists on the line up, or rather the proportion of male to female acts on the line up, but I genuinely believe that this year’s line up was dominated by some of the strongest, and most influential, women in the music industry. The fact it was headlined by Adele supports that, but there were many other brilliant female fronted groups or artists who were utterly fabulous too (Wolf Alice, Jess Glynne, Grimes, Izzy Bizu etc). There’ll be more on this later though. We started the weekend by watching the highly emotional tribute to the late MP Jo Cox, who was brutally murdered recently in her constituency, on the Park Stage. Plenty of colleagues shared their experiences of her and were joined by a crowd of women on the stage wearing what I believe to be the votes for women (women’s suffrage) sash. She was an inspirational woman who had achieved so many great things over her lifetime, and I’m sure she’d have gone on to do a lot more. She worked closely with charities like Oxfam and would actively go out of her way to help others. This was inspiring and I hope I can channel a bit of this in my own life. There was a minute of silence before we were lead into song by Billy Bragg. We explored the whole site this time. There’s so much to do it’s unbelievable. On the Thursday we climbed up to the top of the hill and took an obligatory photo with the Glastonbury sign. The view from this point is indescribable. Words can’t really do it justice; it’s simply breathtaking. From here we found the famous Stone Circle and the Green Fields and Craft Fields. There was so much to make and do that it was almost overwhelming. If that’s not your thing there’s so much going on in the theatre and circus field, like in the cabaret tent where we came across various comedians discussing the newspapers on Sunday morning (very welcomed as we’d not seen the news for days), or in the Kidz Field (Dynamo, THE Basil Brush and that). What I love about Glastonbury is that you could do the festival over and over and get a completely different experience each time. The night areas proved popular after the music had finished (if you could face the long walks in the mud). Arcadia continued to put on stunning displays with guest DJs and was packed out every night. There was also The Common, Block 9 and Shangri-La (or Shanghai, as someone referred to it on the BBC television highlights). Whilst we didn’t necessarily get to see these areas in full swing, I am assured they were just as mad and brilliantly crazy as ever. There was also the festival’s first ever female only venue- The Sisterhood, or something- which we were encouraged to march to after the Jo Cox memorial service. On the Saturday night there was also a tribute to the late David Bowie on the Park Stage with a symphony and a stunning light display. As for the whole “Brexit” (a terrible, terrible phrase, which I fear we’ll only hear more of) thing… It’s hard not to get too political, but it’s difficult to keep in touch with what’s happening outside of Glastonbury at Glastonbury. 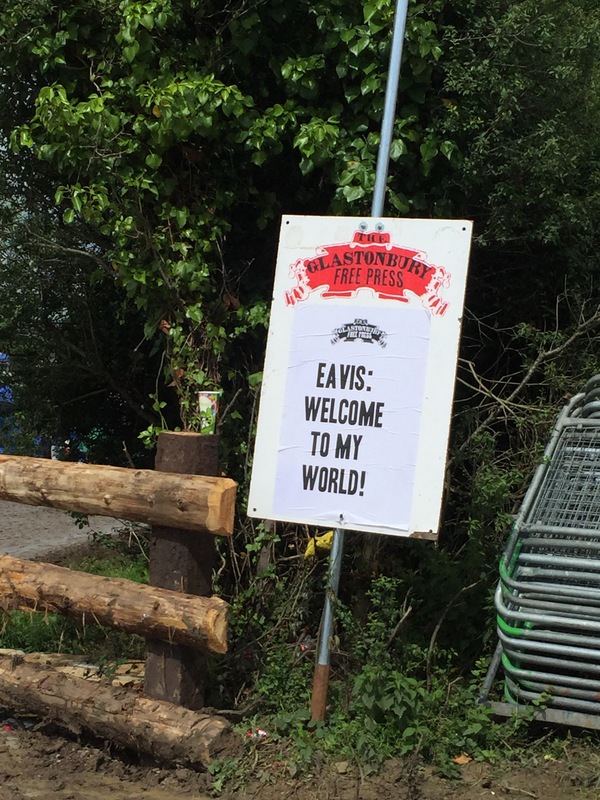 It seemed the UK was in tatters, but Glastonbury was doing just fine. Plenty of bands had their say about it, from The 1975 to Coldplay to Bastille to David Albarn and the National Syrian Orchestra. Years and Year’s Olly Alexander (lead singer) chose to highlight the fact it was gay pride weekend by wearing a rainbow outfit and encouraging the audience to “shove a rainbow” in fear’s face. There’s so much to say about the actual acts though that I’m going to split it up between three blog posts over the next few days and then it’ll all be back to normal! I hope you enjoy. 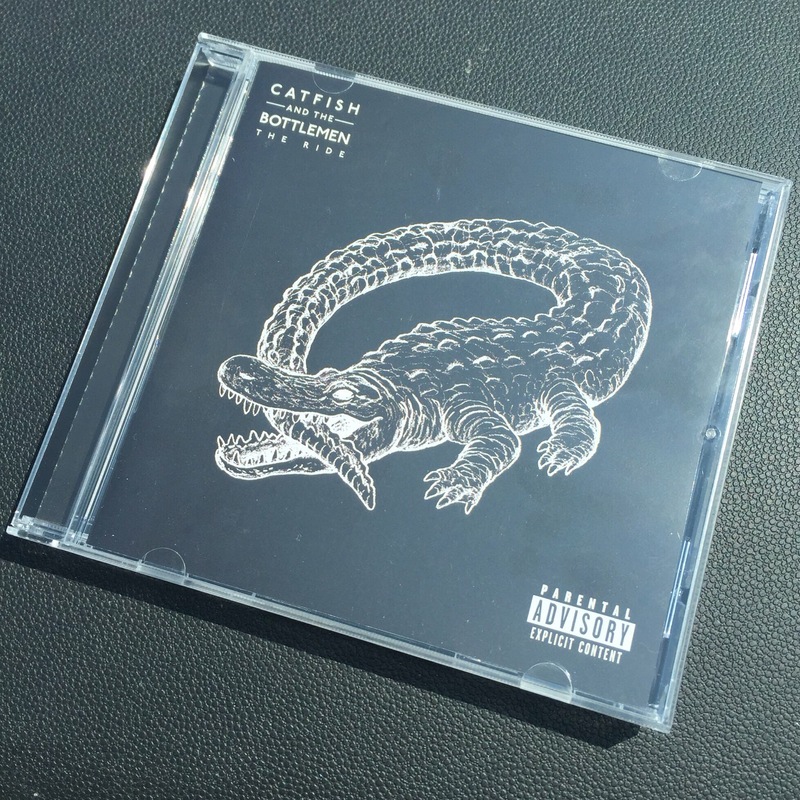 The Ride is the latest- and second- album from Catfish and the Bottlemen. It was released on the 27th May 2016 on Capitol Records and has achieved a worthy number 1 in the UK official charts (maaaad). In the same week they finally announced a UK arena (ARENA!!!!) tour, which visits some of the UK’s most prestigious venues, such as Wembley arena. The singles “Soundcheck”, “7” and “Twice” were dropped before album release, with other songs like “Glasgow” also being previewed before official release. The album opens with 7, which the band have been playing since November time last year. The song is another incredible opener, but the fade in drives me crazy. I’m (clearly) not one for a fade in. I suppose it’s in there to gently build up into the song. The song is huge, you can imagine it being played during concerts and the fans going crazy. The album is full of strong songs. “Twice” being particularly genius. Not only is it catchy, it’s something you want to sing and dance to. It’s quite ‘ballsy and has a brilliant guitar solo (like many of the songs on the album; it’s a current theme). Other songs include the comeback, if you will, single “Soundcheck” (which really reinstates just how incredible Catfish are with its guitar solos, simple lyrics and simple drumming patterns). The breakdown is quite something and Van himself refers to it as a “festival breakdown” too and you can imagine it being played at festivals. “Anything” (one of my favourites on the album), “Postpone” and “Oxygen” are also really strong, with their interesting lyrics and guitar solos. Songs like “Emily” continue the whole name theme (with “Kathleen” on their debut album, ‘The Balcony’). You can definitely see similar song structures throughout as they all seem to become quite similar at first. The album includes two acoustic, slower songs which break up the album. “Glasgow” and “Heathrow” are beautifully written, bittersweet and help the album flow. “Heathrow” has an echoey sound, which reminds me a bit of Jake Bugg. It’s short and overwhelmingly sweet with its clear narrative. The album ends with the formidable “Outside”. Let’s talk about it. The first thing I thought (and perhaps I shouldn’t have, as it’s always best not to look at these things with expectations) was “will it be as big as Tyrants?” The answer was, or rather is, yes. The title of the album comes from the breakdown of the song- “the ride”. I love how Van’s voice sounds. It feels as though Van’s having a conversation with us as a listener… and then there’s ‘the end’- or rather lack of it. It cuts off. Just… Cuts… Off… I suppose, and by the end of the record I’d realised, it completely contrasts the beginning of the album with it’s pompous fade in. It leaves the listener wanting and craving more. I love it. I feel that the stronger songs on the album are all at the start and I hope it won’t become a “sticky start” record (whereby you almost get stuck at the start). Will it be as big as The Balcony, like Van Promised? I think only time will tell. It’s definitely a grower and after a few listens it’s something you begin to love deeply. It’s quite fabulous. Given time I think the album will become something quite special and I look forward to hearing the band play and tour with it live. The best songs on the album, I think, are “Outside”, “Twice”, “Soundcheck” and “Anything”. You can see Catfish and the Bottlemen across many festivals in the UK, like Glastonbury and Truck Festival, and on tour in November throughout arenas nationally. Firstly (and it seems I’ve sadly had to start many of these monthly roundups like this) it seems obvious to mention the sad death of the formidable pop icon Prince. This, like the death of David Bowie back in January, has had a hugely devastating impact on the music industry with many artists paying their respects to the legend across social media. Prince is an artist who shaped the industry and had a lasting impact and effect on many of huge artists of today. He combined visual arts with music and blurred the lines between art, music and reality. There’s no doubt that he’ll continue to have a lasting impact on our culture. In other news… I’M GOING TO GLASTONBURY AGAIN. Ahhhh, how good it feels to be able to say that! I look forward to returning to Worthy Farm this summer and basking in the all the booze filled beauty that it has to offer. This month Glastonbury Festival held their annual emerging talent competition (won in previous years by artists like Scouting For Girls). The competition was won by four-piece band “She Drew The Gun”- who now have the chance to perform at the festival! As well as this, Tom Odell is back with a new album and single. “Wrong Crowd” will be released on the 10th June. So far Odell has released the singles “Wrong Crowd” and “Magnetised”. “Wrong Crowd” is laced with his signature piano, but overlaid with strong beats and whistling sounds. The lyrics themselves are quite simple and catchy. It’s an effortlessly easy listen, despite its clear differences to his older material. I really like the song. I think it’s seemingly ‘cool’. “Magnetised” is similar in its clear differences to older material, but it’s again interesting and engaging. I want to dance to it- which isn’t something you say when talking about Tom Odell necessarily. There’s still traces of piano hidden within the drums, clapping and strong vocals. It’s fascinating to hear Odell sing songs like these and I’m looking forward to hearing the rest of the album having heard these songs. Odell has been playing a handful of dates up and down the country and the odd date dotted across Europe. He’ll also be playing the Saturday of BBC Radio One’s Big Weekend in Exeter later this month. As mentioned previously Radio One’s annual Big Weekend is expected to take play next year at Powderham Castle in Exeter. The line up was released earlier this month. I’m attending on the Sunday and I’m very excited about it. On Saturday there’s the likes of Bastille, Jake Bugg, Tom Odell and Tame Impala nestled in amongst the likes of Bring Me the Horizon, Stormzy and Jess Glynne. It’s being headlined by Mumford and Sons no less who are set to bring a fascinating show to 25,000 or so people! On Sunday the likes of Catfish and the Bottlemen, Wolf Alice, The 1975 and The Last Shadow Puppets join ‘poppier’ choices like Ellie Goulding, Iggy Azalea and The Weeknd. Sunday is being headlined by Glasto headliners Coldplay, with Reading’s Sunday co-headliner Biffy Clyro headlining the In New Music We Trust stage. Whether you’re there or not it’s set to be unmissable and can be caught via the radio, BBC iPlayer and (probably) the BBC red button. There’s also been a Reading announcement with the likes of The Japanese House, VANT, Sunset Sons, The Sherlocks, Blaenavon and Spring King added to the line up. Frank Turner also return for his 10th consecutive Reading and Leeds Festival (and he’s opening the main stage on Friday morning at Reading). These acts join the likes of The Vaccines, The 1975, Haim and The Wombats, who have all previously been announced. This is most likely the last- or one of the last- “big” announcements. The further few will most likely be smaller, up and coming acts for smaller stages or acts for stages like the alternative stage. This month there has been the release of plenty of great albums from The Last Shadow Puppet’s “Everything You’ve Come to Expect” to Sunset Son’s “Very Rarely Say Die”. There’s also been major American music festival “Coachella” which is often celebrity filled and special guest packed! This year the likes of The 1975, Wolf Alice, Years and Years and Foals played the festival. It was headlined by LCD Soundsystem, Guns n’ Roses and Calvin Harris. It seems like Glastonbury’s lesser muddier cousin! Ahhh it’d be silly not to mention the random bit of Adele in this month’s playlist. I’m not a huuuuuuuge fan of Adele usually. I like her music and obviously know quite a bit of it as I feel it’s probably obligatory or something in today’s society, but there’s something about “When We Were Young” which I adore so much. It’s simply a sweet song. The piano and some of the harmonising parts were provided by Tobias Jesso Jr., as the pair wrote the song one day. It’s quite incredible, in my opinion. In this month’s playlist there’s also a bit of Black Honey (who I’m loving having seen- and met- them as support for Catfish and the Bottlemen earlier in the month), Slaves (with their cover of Skepta’s Shutdown because why not), Hinds and Panic! at the Disco (again, a random one, but one that just kept popping up this month). Also, George Ezra is baaaaack on the playlist… He’s been missed. With warmer weather threatening to appear, it was obvious to have Ezra back on the playlist! There’s a lot to look forward to in May, with the most obvious thing being Radio One’s Big Weekend. I’ve always seen the Big Weekend as the beginning of festival season and, ultimately, summer. I’ve also got Jake Bugg at Banquet Records to look forward to on the 5th May. The gig should be pretty special as it’s always nice to see artists, like Bugg, play in special venues like that. I’ve also got Rat Boy on the 7th May too. I’m expecting it to be hot, sweaty and exciting. There’s so much happening this month (and hopefully I’ll be able to keep this blog up to date as it happens)! At the beginning of this year I wrote a blog post about a few (of the many) bands that I think you should look out for this year and Sundara Karma were one of them. Having toured with bands like The Wombats and played sets at festivals like Reading, they’re already on the path to success. On the 27th February 2016, at Brighton’s ‘Patterns’ (which was previously called ‘Audio’), Sundara Karma played a short and sweet, yet ridiculously hot and sweaty, set supported by Blaenavon and Beach Baby. The band opened with their latest single “A Young Understanding”. Heavily laced with electric guitars and The Vaccines style vocals, it got the crowd warmed up. The song is from their debut album, which they hope to release later this year. They played many songs from said upcoming album, including “Olympia”. With memorable chorus’ and catchy melodies the album is looking promising thus far and I eagerly anticipate its release. They played a mix of songs from their previous EPs, “EP I” and “EP II” (which I bought whilst I was there), which the audience knew and sang along with. These songs are made to be performed live in front of an audience and it worked especially well in this venue due to its intimate feel and smaller capacity. The highlight of the set, for me, was “Flame”, which they played quite early on. “Flame” was the first song I knew of the band and the audience seemed to enjoy it too. People sang and danced, whilst the middle of the audience jumped as one. The atmosphere was especially buzzing for this song (which was the same when I saw them play Reading Festival last year). The band played a short, two song encore, which consisted of “The Night” and “Loveblood” (both from 2015’s EP I). “Loveblood” was another highlight for me as it topped off the night perfectly. The audience knew these songs really well and collectively sang along with the band. Having finished the set they hung about afterwards for fans to say hello, and that’s my favourite thing about bands (and venues) like this. It makes the evening extra special! Sundara Karma are destined to play huge stages in the future, but for now the intimacy of Patterns (which was quite literally underground) was a perfect place for the band to exhibit new music to a youthful crowd (although there were handfuls of older people there too, and why not as the band are great), whilst anticipating an album release. The evening was exciting, whilst undeniably hot due to all the jumping and dancing. They had an amazing stage presence and a clear talent for music. They’re definitely ones to look out for and catch at some of the festivals they’re doing this summer, as well as on their current headline tour.